Its been a while since I picked on our old friend Hamid Karzai. Like the itch you cannot scratch he is impossible to forget. See link. Ticked off at the brazen packing of the Afghan election commission (which unearthed his election fraud) with cronies the Obama administration sent him a message by withdrawing his invitation to visit Washington. Since then the mayor of Kabul has been sulking in his palace, garbing himself in the cloak of Afghan nationalism and irritating Washington by flattering the electoral thief on his western border. Its hard to see what Karzai’s strategy is. He has no base and no army loyal exclusively to him. He remains propped up by the dual support of Washington and his warlord cronies. Washington’s patience has run out. The fate of Mohammad Najibullah should warn him of the perils of relying on mercurial warlords. What he needs more than ever is to midwife a resolution of the Afghan civil war before the Americans leave and then pray that Pakistan’s usual games in Afghanistan do not cause his regime to crumble. It will require diplomatic tact and statesmanship that has not yet been on display. But instead Karzai fiddles in the Afghan ruins, watches Pakistan force itself into the Afghan negotiating table and irritates the only people who can keep him in power. Joe Biden once proposed partitioning Iraq. That may be in Iraq’s future. It is a pity he did not propose something similar for the basket case buffer that is the legacy of the Great Game. 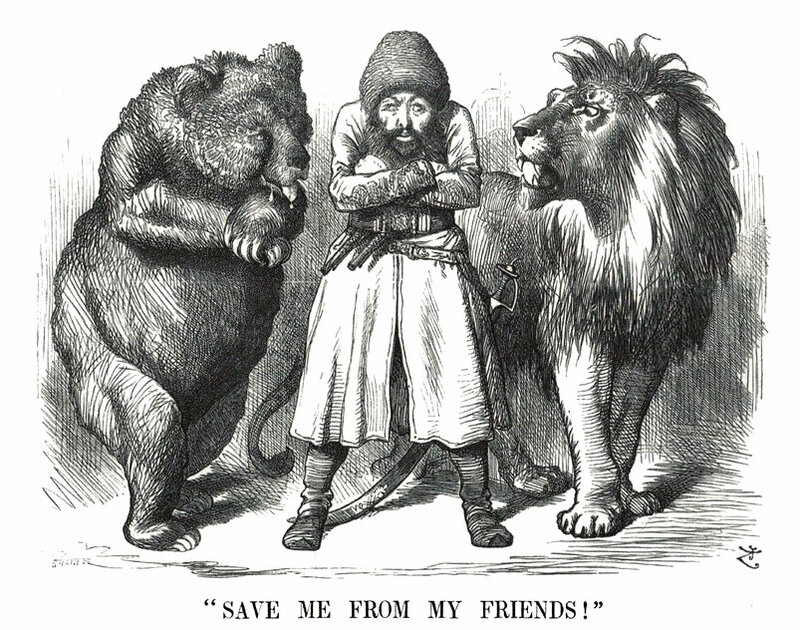 Political cartoon depicting the Afghan Emir Sher Ali with his "friends" the Russian Bear & British Lion (1878). The cartoon from 1878 above seems oddly prescient. Just the participants have changed. Matt Yglesias has a good article comparing Romneycare to Obamacare and Mitt Romney’s transparently dishonest attempts to run away from his legacy. See link. He also discusses the fundamental flaw in the Republican position which accepts the need to prevent insurance companies from denying coverage to people with pre-existing conditions without understanding that such a provision cannot stand alone. This point is not new. Others like Paul Krugman and Jonathan Chait have raised this point in responding to people like Peggy Noonan. See here and here. The point is simple. If insurance companies cannot deny people with pre-existing conditions you create an incentive for healthy people not to get insurance until they fall sick. Hence you need a mandate to take care of the free-riders. But once you create a mandate you need subsidies for people who cannot afford health care. The end product is something along the line of Romneycare, Obamacare or a robust public option (which is probably more popular than either). Given that Republicans support an ban on insurance companies discriminating against pre-existing conditions they need to come up with a meaningful alternative to Obamacare, not that nonsense of a plan they previously issued which expanded coverage by only 3 million. Otherwise it is time for them to focus on responsible fixes to the plan, notably on the issue of cost control. Somehow, I don’t see that happening. The passage of health care reform may have had the unintended side effect of winnowing the 2012 presidential field. While the 2012 Republican convention is over two years away, an eternity in politics, Mitt Romney may have just seen his hopes of securing the Republican nomination go up in smoke. Romney’s ambitions and his willingness to adapt his positions to the prevailing winds are no secret. Even by the low standards of politicians he displayed a chameleon like ability to change his colors for the prevailing audience and the brazen chutzpah to attack people for holding positions he held a short while before. This made him very unpopular among his fellow Republican candidates notably John McCain and Mike Huckabee who barely concealed their disdain for him. The 2007-8 Republican presidential debates often degenerated into “whack-a-Mitt” sessions where all the candidates ganged up in the self funded Romney with cheerful glee. See link. His Mormon faith also acted as a handicap as the Republican evangelical base looked at him with suspicion. When John McCain all but wrapped up the Republican nomination the ever malleable Romney promptly dropped out to stump for McCain in hopes of securing the Vice Presidential nod. Unfortunately all that sucking up came to naught when McCain went for the wonderfully clueless Sarah Palin. In the aftermath of the elections Romney has tried to reposition himself as the only remaining adult among the Republican candidates. His extensive business background lends him a public perception of gravitas on economic issues. He has stayed away from an embrace of the occasionally unhinged tea party protests. His attempts to burnish his credentials on foreign policy were less successful since his Palinesque use of jargon and tough words largely drew snickers. See here and here. But for a long time the sword of Damocles hanging over Romney was his signature accomplishment as governor of Massachusetts – health care reform. In the Republican primaries Romney defended his plan but faced a dilemma when the contours of Obamacare started to look very similar to Romneycare. While even the latest Wall Street Journal editorial replete with Republican talking points (some discredited) refers to the two plans as “fraternal policy twins” Romney has been busy tying himself in knots in explaining how the plans are different and whining about the alleged abuse of power by the Democrats in not deferring to a minority that lost the last two national elections. This is a big problem for Romney. With the Republican base whipped up into a frenzy the next nominee will have to attack Obamacare. A federalism argument could work, but can also be countered by the fact that the balanced budget obligations on most states make it extremely impractical for any of them to pass health care reform. In any case federalism will not explain away Romney’s willingness to sign on to government interference at the state level, something that has the base in a lather. Even with Romney penchant for short term memory loss on his previous policy positions, it is hard to see how Romney will be the candidate to perform that task. Democrats will gleefully paraphrase the attack used on the last nominee from Massachusetts that Romney was “for health care before he was against it” to cement Romney’s reputation as an unprincipled flip-flopper. A base already predisposed to distrust Romney will have a hard time trusting him as the man to take down Obamacare, which practically will be very hard to pull off in any case. So the man who should have been the Republican nominee and had the best understanding of economic policy will enter primary season severely hobbled. Again things can change. A continuing bleak economic outlook could cause Republicans to hold their nose and vote for Romney, like they did for McCain in the last election cycle. Repealing health care reform could be a fringe issue by 2012 and Romney could position himself as the man best equipped to fix it. But at present it is hard to see Romney securing the support of a distrustful base. IMO the man the Obama campaign should worry about comes from next door Indiana – Mitch Daniels, though a lot can change in the next two years. I have never cared for Congressman Dan Lipinski. The dislike is not personal since I do not know the man personally and not rooted by deep animus towards his political positions. They stem largely from his nepotistic elevation to office in 2004 by his father Congressman Bill Lipinski. Lipinski pere had been in Congress in various Chicago districts for about 20 years and won the 2004 Democratic Primary. Then in August after the Republicans presented him with the usual token opposition in his Democratic district he abruptly withdrew and got party honchos to nominate his son, then a professor at the University of Tennessee. Much could be forgiven had Lipinski fils emerged into a statesman of stature after this unfortunate introduction to politics. Sadly he has been an undistinguished backbencher who occasionally aggravates local progressives with blue dog tendencies. Understandably they get peeved at having to put up with this in what should be a safe Democratic seat. On Sunday Dan Lipinski (after previously proclaiming his support of health care reform) became the only Democratic Congressman from Illinois to vote against health care reform. See link. Since the bill passed I am not unduly incensed by Congressman Lipinski’s latest apostasy. What has drawn my ire was this post by local Chicago journalist Lynn Sweet. See here. If accurate, and there does not seem to be a reason to doubt the reporting, Bill Lipinski’s nepotistic activities were not triggered by dreams of a local political dynasty. Evidently they were triggered by the desire to create a comfortable Congressional sinecure for his son to provide him health insurance, which per Sweet’s latest edits gives him the opportunity to purchase lifetime coverage upon retirement. Dan Lipinski is a diabetic requiring daily insulin shots. He does not have to worry about being rejected for pre-existing conditions anymore. And yet the good Congressman voted against a bill introduced by his party making insurance available to people with pre-existing conditions without parents who can get them into Congress as a backup plan. Now that his sinecure has served its purpose it is time to send the Congressman back to Tennessee or wherever. Unfortunately with Illinois’ ridiculously early primary calendar (a legacy of the last presidential primary) we are stuck with him for another term. Left for dead after the upset victory of Scott Brown in Massachusetts, health care reform came roaring back tonight. After a week of arm twisting and persuasion, Speaker Nancy Pelosi locked up the votes to pass the original Senate bill. The bill now goes to the President for his signature after which the fixes to the Senate Bill will go to the Senate for passage thru the reconciliation process. See link. In an interesting twist the Republicans no votes to the fixes in the Senate bill will essentially be yes votes towards keeping Ben Nelson’s infamous “cornhusker kickback” in place. A competent political party would use it to highlight the Republican transformation into the Party of No, but this is the Democrats we are talking about. One heartening thing in the last week is the emergence of the Democratic spine. In the aftermath of the Brown victory many Democrats were ready to fold. To me it made no sense. The yes votes on the previous bill were already on record in the Senate and the House and the Democrats were going to get pilloried for it. The Democrats are not likely to get as big a majority in the near future. Failure to pass health care reform after coming so close guaranteed a dispirited base that would not turn out in November. Now Barack Obama and the Democrats can go into the elections by pointing to the legislative accomplishment of our generation that even with its many flaws makes the United States the last industrialized country in the world to provide universal health care access. The Republicans will run on a platform on repeal. Don’t hold your breath on them ever actually passing a bill repealing a ban on insurance companies canceling policies for sick people, denying health care coverage for pre-existing conditions or subsidies for the poor to obtain health insurance. In their honester and off the record moments the Republicans will admit that as well. As in Massachusetts this bill will grow in popularity. Maybe if the Republicans break from their thrall of right wing talk radio they will work with the Democrats to get meaningful cost control provisions and tort reform into the bill. Selection Sunday arrived and soon causal and serious sports fans will furiously start filling out brackets in office pools across the country. March sees the college basketball world caught up in tourney madness as the United States focuses in possibly the most entertaining sports post-season in the country. At the end a champion will be crowned based on performance on the field and nobody will quibble that a deserving championship contender was somehow left out. It provides a stark contrast to the short-sighted greedy leaders who run and are slowly ruining the most popular college sport in the country – Division 1A College Football. Unwilling to share the revenue pie with smaller schools (who in any genuine playoff would have to have a shot at the title) the leaders of major colleges come up with an increasing array of excuses as to why a playoff (which every other sport including Division 1B, 2 and 3 football implement with little trouble) would not work. Given the popularity of football, one would think that the TV revenues and fan attendance for a meaningful post-season decided on the field rather than by coaches and media polls would be a revenue bonanza. Instead in the name of tradition and “protecting the players” we are treated to an array of bowl games between mediocre teams and no guarantee that the “national champion” deserves the title. Enjoy the coming sports extravaganza while thinking of what could also happen in late December. And also pray that March madness is not diluted by the pending asinine proposal to expand the number of teams from 65 to 96. Let the madness commence. Evidently being elected excuses authoritarianism and locking up vocal critics. Must be news to the Catholic Church that principles that are central to its mission are akin to the Nazism and communism. Beck was presumably targeting his usual liberal targets but used his typical broad brush strokes to incorporate any Church activities aimed at aiding the poor. It is interesting to note that social justice was the rallying cry of the liberal churches who opposed slavery and segregation. Of course in the alternate reality of Glenn Beck, progressives used to be called “tyrants,” or “slave-owners — people who encouraged you to become dependent on them.” See link. See link. Setting aside the lack of awareness of the racial ancestry of of the “impostors” this is hardly the way to generate a discussion on how to encourage baseball (which has not held up well to competition from basketball and football) in the African American community or to address concerns that players in Latin American communities countries are being exploited. After doubling down on his comments initially, Hunter has since decided to zip it using the old “taken out of context” routine. Toyota’s beleaguered executives must already be wishing that 2010 is a distant memory. The last couple of months have seen the Toyota brand name get battered and the increasingly confident (some would say over confident) industry leader discover that its management structure is now the subject of discussions in business schools – on how not to run a disaster response. A brand name painstakingly built up over the last few decades is being shredded as Toyota executives struggle to assuage the concerns of Congress and panicky customers that they have solved the mystery of why some cars unexpectedly kept accelerating. But the unfortunate timing of events today bring to mind the classic Kevin Bacon performance from Animal House. The day starts with Toyota conducting a demonstration intended to “prove” that software glitches are not responsible for some cars randomly accelerating. See link. Fair enough. There are even some who think the hysteria is being blown way out of proportion. See link. Unfortunately, on the very same day a rogue Prius took off and reached speeds of 94 mph where a sticky gas pedal and not the mat obstruction for which there was a Prius recall appears to have been the problem. See link. Luckily the driver of the vehicle was not injured. We still don’t know what caused the Prius to take off today, but this reinforces the urgency for Toyota to get this problem behind it as soon as possible. This is not the only blog or news article to note the awful timing of the episode for Toyota.